Two weekends ago, after finishing my last skein of yarn, I decided to actually spin something that had a label, and thus not only a name, but an actual record of what the fibre content might be. Imagine that! So I grabbed two 35g HilltopCloud batts that I received as a set (there were actually three, but I fired one off to my friend, Val as part of a fibre-y care package last fall) and figured I’d spin those up before starting on what I have been considering “the good stuff”. 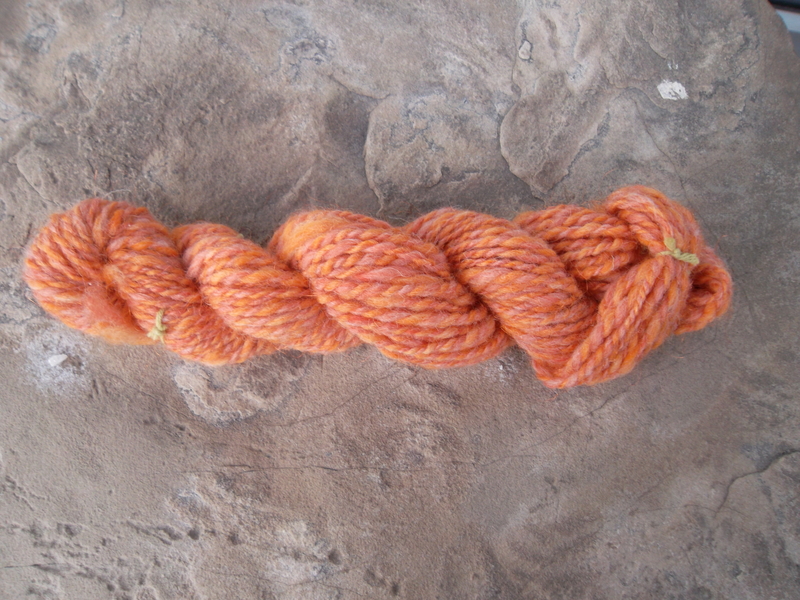 The fibre content was listed as 43% British Shetland, 43% Merino and 14% nylon (which translates to orange sparkly stuff!). They were two different orange shades, and the tag suggested that one might want to ply them together for a tweed-y effect. 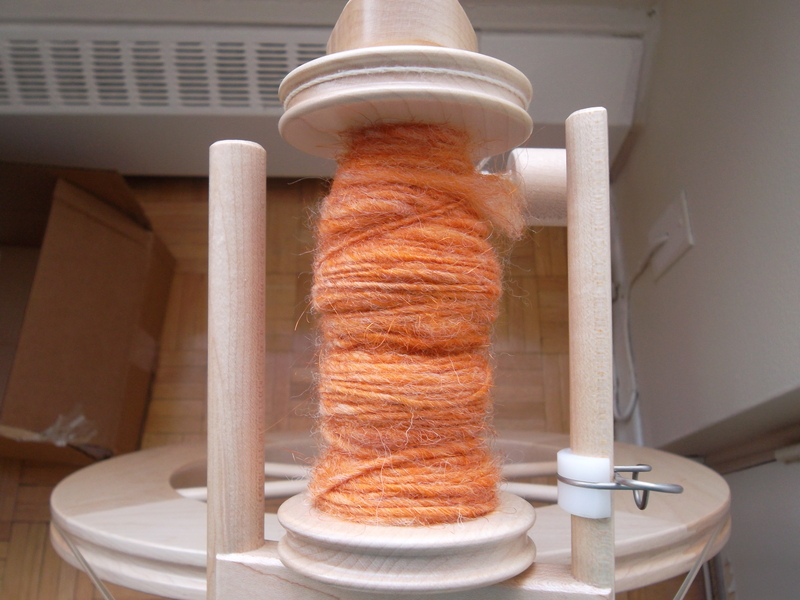 I started spinning up the darker orange and never having used a batt before, I spun it straight from the batt. No dividing or anything, which I found out later would have been the more “standard” way to go. In any case, the single turned out something like this. I then waited a week, figuring I’d spin up the lighter one the following weekend. This weekend past was busier than anticipated and my schedule got thrown off track by unexpected visitors. Sunday evening, I finally got a chance to sit at my wheel and spin up the second batt. This time, I divided the fibre into what turned out to be eight strips. I forgot to take a picture of the single because I literally pulled it off the wheel, placed it straight onto the lazy Kate and plied the two singles into this. I ended up with several extra yards of the lighter one – so I suspect I am getting better at spinning thinner yarns. At the end, I still only ended up with 65-70 yards (I can’t believe that I forgot to write down the length!) and I have not done a wraps per inch. But I suspect it’s bulky-ish. It is also massively itchy so even if I had enough to knit something with, I wouldn’t knit anything to go next to my skin. I’d like to find more time during the week to spin maybe 20-30 minutes a night but so far, that’s just not happening. I did get a chance to prep my new braid, though. Next up…some very pretty ultra-violet BFL. This entry was posted in Uncategorized and tagged spinning by Rayna. Bookmark the permalink. I don’t think that there is a ‘standard’ way to go. I often spin right from the batt without dividing and the same for a braid. Also if you wind your leftover single into a centerpull ball, you can ply both ends together for the rest of the 2 ply. That’s good to know. I was once told (when I had been spinning on a spindle for about two days) by Abby Franquemont “just grab a handful of fibre and start spinning”…and I thought that was the most insane recommendation I ever heard. But that’s pretty much exactly what I did. Straightened out the batt… and just went with it. And thanks for the compliment. I am pleased with my progress so far, even if I have a long way to go! Wow – I can really see the difference between the three skeins you’ve put up so far – This last one is gorgeous! Thanks, darlin’! I can see a difference too, which is happy making.